I have seen media reports that the state of California is close to effectively “banning the Bible” in that state. The bill in question has overwhelmingly passed the lower branch of the California Legislature and will become law if it passes the Senate and obtains Governor Brown’s signature. 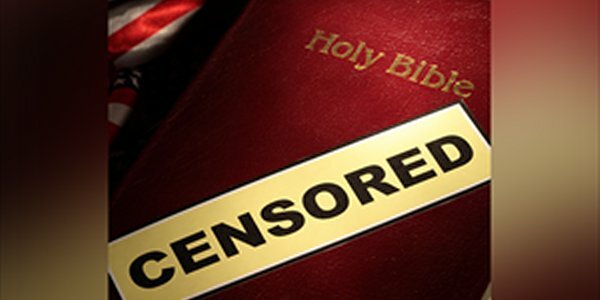 The first and second links make the case that the bill intends to ultimately ban the Bible altogether by starting with a bill to criminalize efforts to convert homosexuals to heterosexuality. That both the Old Testament and New Testament forbid homosexuality and label it a sin, is not in doubt (see Leviticus 18:22, Romans 1:25-28). 1 Corinthians 6:9-11 records that homosexuals, were successfully transformed to heterosexuals, in the Apostolic era of the Christian Church. The first two links make a good case that the bill’s intent is ultimately to “ban the Bible” by steps. The third link, from snopes.com, labels these claims as false. However, I have seen internet reports which assert that snopes.com is reliably Leftist in its perspective. The fourth link critiques the snopes.com report and finds it wanting. I have included both viewpoints for readers and readers can make up their own minds on the subject. Personally, I think the first, second and fourth links are correct. Also, advocates deny the bill will “ban the Bible” based on statements by the bill’s authors (at least one of which is an open homosexual). These statements by a legislative bill’s authors have little weight in any legal application of a final bill’s language. The judiciary ultimately decides what any bill means if it is the subject of litigation, and California is known for having a very judiciary. Such a bill, if passed in California, would almost certainly go the US Supreme Court. If the bill is stopped, it may well be those sheer economics maybe the reason for it not becoming law. The fifth link relates that California is already beginning to lose business from Christians choosing not to do business in California simply due to its consideration of such a bill. If the bill actually became law, Christians everywhere may choose to avoid traveling to California or patronizing its business vendors. Christian families could easily choose to boycott California in their vacation plans. If the entire mass of Christians in the US choose to boycott California due to such a law as is proposed, it would be a large enough customer base to bankrupt many California businesses–especially those in the tourist and hospitality industries. The sixth link also reveals that there is a huge reservoir of Americans who still adhere to traditional Judeo-Christian morality, and the results of the poll in that link ought to give pause to anyone in the California government about the damage that could be done to California’s economy if the bill passes and Christians take their business to other states. California could hardly object on any legal ground that any such economic boycott is illegal. California’s state government believes in economic boycotts. The seventh link cites an action by the California state government to forbid government-related travel by its officials to Oklahoma due to its “anti-gay” adoption laws. Since California has already made it clear it believes in boycotts based on morality issues, it cannot object when it is the target of efforts to boycott California due to what Christians believe is the state’s immorality based on biblical laws. The economic boycott instituted by California against Oklahoma is why Christians have every reason to believe the real intent of the California bill is to eventually ban the Bible and Christianity itself. California seeks to impose a pro-homosexual agenda on Oklahoma (and other states) where California has no jurisdiction. You can imagine how harsh California will be on Christians inside California where the state of California does have jurisdiction. California seems determined to become a new “Sodom by the sea.” I’d like to point out that ancient Sodom’s pro-homosexual agendas didn’t work out too well (Genesis 19). Christian and Bible-deniers would say “But the Bible can’t be shown to be true. Sodom hasn’t been found!” I’d beg to differ. The final two links reveal information about an archeological dig which claims to have found ancient Sodom and which cites evidence it was burnt in a great fire–exactly what Genesis 19 asserts. That archaeological expedition was led by a Dr. Steve Collins, but that is not “yours truly.” That Steve Collins and I are doppelgangers to each other, but I saw a cable-TV documentary about his archeological evidence for finding Sodom and he makes a very good case. A final few observations are worth making. God is very patient, but there comes a time when he will not be mocked (Galatians 6:7) and he takes direct action. The destruction of ancient Sodom was one such example. If California passes this “ban the Bible” bill and other anti-Christian legislation as well, the state of California will be emphatically saying to God “Up yours!” California sits on many earthquake faults. Seismologists have asserted that the “Big One” could be due at any time in California. All God has to do is give the San Andreas fault a strong state-wide shake and California will experience a natural catastrophe unparalleled in our nation’s history. If this happens, I can almost predict what will be one post-earthquake phenomenon. Bible-believing Christians will organize faith-based rescue efforts and atheist Californians will be fed and helped by the very Christians they hate.